Every weekday morning, Fran Crisler boards a Route 65 bus with his daughter and travels with her to Barack and Michelle Obama Elementary, a block west of Dale Street. “They don’t let me get on the school bus so she won’t get on either,” Crisler said this week, returning home after seeing his daughter off at the St. Paul school. Crisler doesn’t mind the ride. 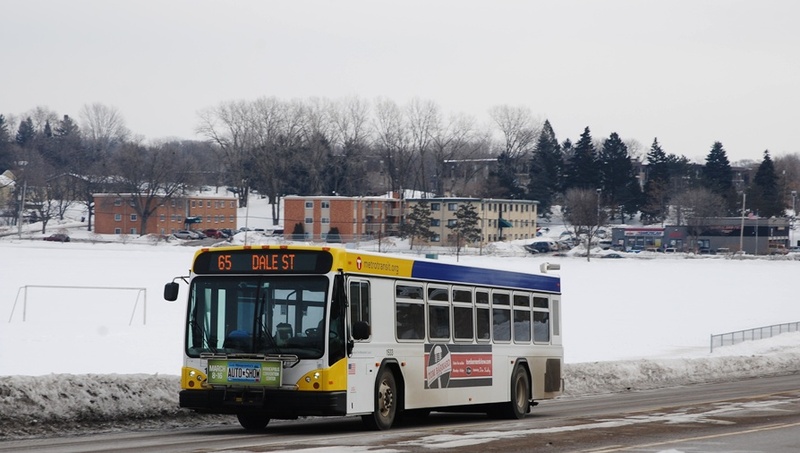 In fact, he regularly uses Route 65 to travel the Dale Street corridor and to get to downtown St. Paul. On a recent weekday morning, he was joined by plenty of others traveling to work, school or appointments and using the bus as a way to avoid the hassles and costs of driving. Among them was Abdi Teferra, who has commuted on Route 65 for the last three years. Teferra boards at the Rosedale Transit Center, at Roseville’s Rosedale Center, and rides to work in downtown St. Paul. Teferra saves money by using a Metropass that allows unlimited rides instead of paying for gas and facing parking costs of up to $9 a day. “I have two kids so saving that money means a lot to me,” said Teferra, who uses his time on the bus to read, catch up on e-mail or simply relax. Traveling southbound, Teferra’s end-to-end trip takes around 40 minutes. From Roseville, Route 65 buses run south on Snelling Avenue and east on County Road B to Dale Street, where they continue southbound to Selby Avenue. 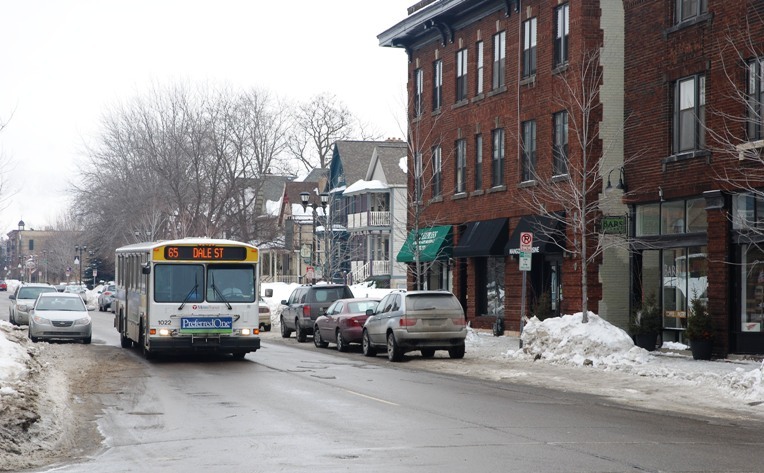 Buses travel through the Summit-University neighborhood and enter downtown St. Paul via Summit Avenue, with rush hour trips terminating at the Union Depot. Midday and evening trips going as far as Jackson and Sixth streets. South St. Paul resident Dave Campbell takes Route 65 the other direction, using a Route 68 bus to get downtown and transferring to Route 65 to get to his job at Rosedale Center. Campbell turned to the bus after his vehicle broke down three months ago. While he may go back to the car eventually, he has appreciated having the bus there during his time of need. “It has been a real blessing that I’ve been able to take the bus,” he said. When the METRO Green Line opens June 14, Route 65 customers will be blessed with something else – a connection to the Dale Street Station. Service on the route will also be improved to every 20 minutes. Erma Flowers, who boarded Route 65 near her home at County Road B and Snelling Avenue, said she is looking forward to the Green Line’s opening, which she hopes will make it easier to travel to Minneapolis. Because Route 65 customers will be able to transfer to the Green Line, the route will no longer go to downtown St. Paul but instead continue south to Dale Street and Grand Avenue. The change will go into effect the same day the Green Line opens. Tory Hart, who used Route 65 while at Roseville High School, said he'll start combining trips once the train opens. Hart lives off Dale Street and said he will take the bus to Dale Street Station and ride the train downtown any time he wants to get to an event. “That will be a lot cheaper and easier,” he said. Service: Route 65 runs between the Rosedale Transit Center in Roseville and downtown St. Paul. Traveling southbound, buses run on County Road B to Dale Street and Selby Avenue. Buses enter St. Paul via Summit Avenue and Kellogg Boulevard. 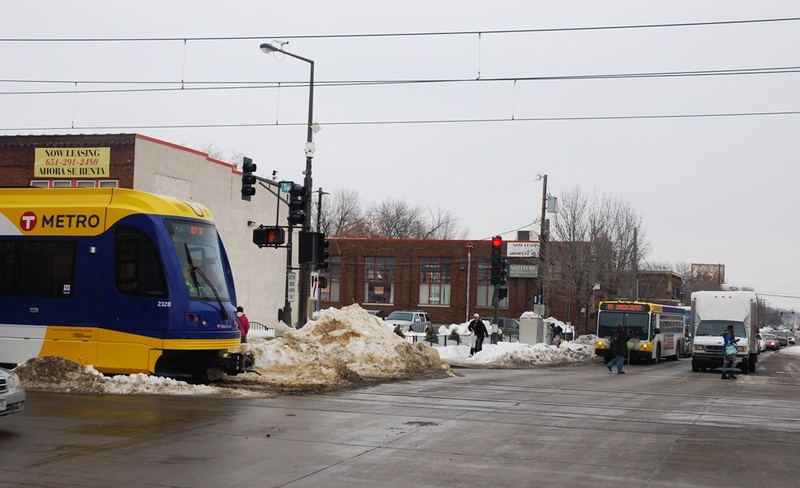 In St. Paul, peak hour trips terminate at Union Depot while midday and evening trips terminate at Jackson and Sixth streets. Weekday trips run every 30 minutes beginning from 5:30 a.m. to 6:30 p.m. and every hour until 10:30 p.m. Trips run every half hour between 8:30 a.m. and 7:30 p.m. on weekends. History: Streetcars operated on Dale Street from 1914 to 1952. The Dale Street line intersected with several east-west routes and used shared tracks on Grand Avenue to downtown St. Paul. The line went as far north at Maryland Avenue, where it veered west and ended on the eastern shore of Lake Como and Como Park. Buses replaced streetcars in 1952. Future: When the METRO Green Line opens June 14, Route 65 will connect to the Dale Street Station at University Avenue and Dale Street. Buses will no longer go to downtown St. Paul via Selby Avenue. Instead, service will continue on Dale Street to Grand Avenue as they did from 1953 to 2001. Service will be improved to every 20 minutes from 5 a.m. to midnight Monday through Saturday and from 6 a.m. to midnight on Sunday. More details can be found here. Green Line maintenance is currently underway. Replacement bus service is now in effect at select Green Line stations. Find out all the details here.